Jesus knew what they were thinking. So Jesus took a little child and stood the child beside him. Then Jesus said to the followers, "If a person accepts a little child like this in my name, then that person accepts me. And when a person accepts me, that person accepts the One (God) that sent me. The person among you that is the most humble—that person is a great (important) person." Jesus turns the whole discussion of greatness upside down. Instead of greatness being determined by status, position, and having others wait upon you, greatness is determined by serving those whom others don't see as important. In Jesus' day, associating with children was considered a waste of time by important people. The child becomes a symbol of those viewed as unimportant—only insignificant people spend their crucial time on kids not their own. However, Jesus says that a truly important Kingdom person is going to find the left out, the forgotten, and the neglected as well as welcome and serve them rather than trying to name drop and hang around with the "in crowd." Greatness is about serving, not about status! 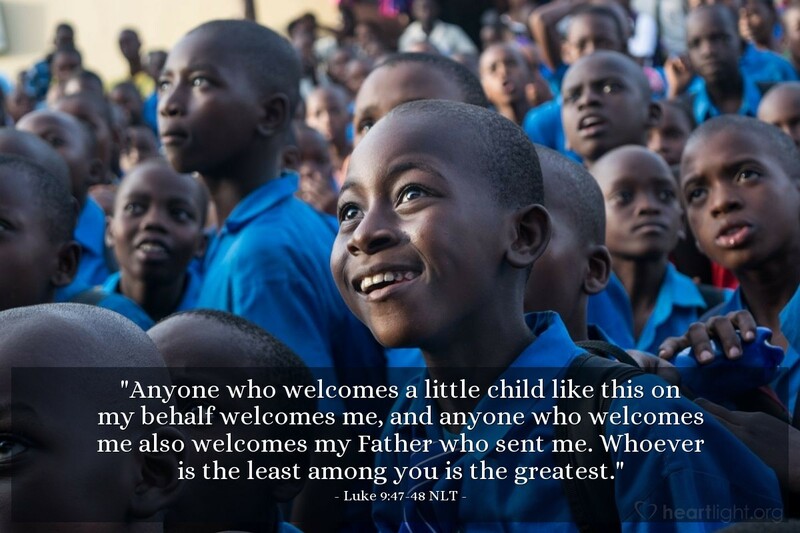 Father, give me a heart to welcome those who are left out, overlooked, and forgotten in my world. Please humble me gently so that I am not so full of myself that I won't help others in need and associate with those whom the world might not value. Make me more like your Son. I pray in Jesus' name. Amen.